Tiny (Martin J.M.) Kox was born on May 6, 1953 in Veldhoven, Netherlands. He is married and has two grown up sons and two grandchildren. Since 1973 he lives in Tilburg, where he was from 1982 – 1999 member of the City Council for his party, the Socialist Party (SP). From 1993 – 2003 he was elected and re-elected as the SP’s General Secretary. Since 2003 he chairs his party’s Group in the Dutch Senate (First Chamber States General). Since 2003 Kox is member of the delegation of the Dutch Parliament to the Parliamentary Assembly of the Council of Europe (PACE). 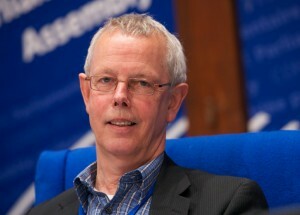 In 2007 he was elected Chairperson of the Group of the Unified European Left in PACE. He represents UEL ex officio in the Presidential Committee, the Committee on political affairs and democracy, the Monitoring Committee and the Committee on rules of procedure, immunities and institutional affairs. Tiny Kox chaired PACE’s election observation missions in the Russian Federation (2011 and 2012) and in Bosnia and Herzegovina (2010 and 2014). He was the Assembly’s first rapporteur on the partnership for democracy of Palestine (2011 – 2014). From 5 – 8 June 2015 Mr. Kox chaired the 29-member delegation of PACE to observe the parliamentary elections in Turkey.